In a new study, published today in Frontiers in Plant Science, researchers at the University of California, Davis, have identified a set of molecular markers that influence the onset of Pierce’s disease in grapevines. 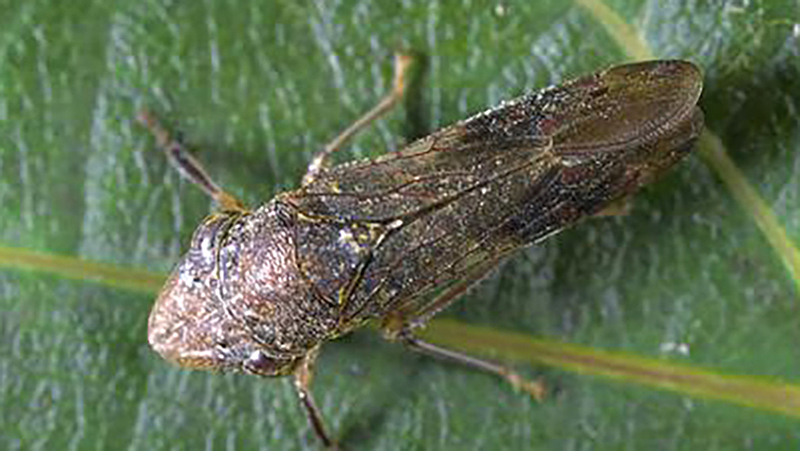 The glassy-winged sharpshooter injects the Xylella fastidiosa bacterium into the plant’s xylem, which is the part of the plant that carries water. The disease causes leaves to yellow or “scorch,” eventually drying up and dropping from the vine. It can kill a plant in three to five years. Few diseases can kill grapevines so quickly. The glassy-winged sharpshooter was first reported in California in 1994 and can travel greater distances than native sharpshooters. By 2002, the glassy-winged sharpshooter had infested more than 1,100 acres of grapevines statewide. In this study the authors looked at the plant’s responses to the disease compared to healthy plants. Better understanding the biochemical changes with onset of the disease can help foster new strategies to increase plant health, rather than having to use insecticides to fight disease. Scientists have long thought the bacteria growing in the xylem blocked the flow of water to the leaves. The blockage might be part of the problem, but it does not answer all the questions. More than 200 plant species harbor the bacterium but are asymptomatic. Having identified molecular markers important for Pierce’s disease in grapevines, researchers can use them to study grapevine varieties or other plants that do not develop disease. Co-authors include Hossein Gouran, Sandeep Chakraborty, and My Phu with the UC Davis Department of Plant Sciences; Dario Cantu with the UC Davis Department of Viticulture and Enology; and Rafael Nascimento and Luiz Goulart with the Institute of Genetics and Biochemistry at the Federal University of Uberlandia in Brazil. The study was funded by the California Department of Food and Agriculture Pierce’s Disease Board and CAPES, a Brazilian scientific research funding agency.